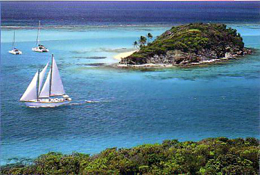 We were happy to hear that ALOHA MALOLO has changed their plans and will continue chartering in the Virgin Islands and possibly other Caribbean destinations through May 2013. "Aloha Malolo’s newest addition is Chef Jennifer Williams and we couldn’t be more thrilled to have her aboard. 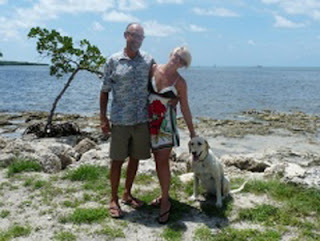 Chef Jennifer grew up on the water in Florida but has traveled the world extensively and "has never met a stranger". She has always felt most at home on the water and says it’s where it all starts and stops… contentment! Rumor has it that an invitation to dine from Chef Jennifer has never been turned down. Jennifer’s love of people and cooking glean through in her cuisine. Her culinary skills will delight any fine dining aficionado’s refined palette or can soothe one’s soul with simple southern comforts. Our Chef has led a holistic life since 2000 and cooks with only fresh ingredients. Recent guest Chance Lillo is quoted as saying her tequila-lime Mahi tacos (with fresh cilantro sauce) were the best thing he’s ever tasted… though she’s too humble to admit it. "Jennifer’s selfless nature, exuberant attitude, and infectious laughter are certain to make you feel right at home aboard the Aloha Malolo." Captain Eric fell in love with life on the ocean 30 years ago during his first 9-month passage, sailing from Los Angeles to Panama. Aloha Malolo and Eric have been together for 14 years and this is the fourth boat he’s had the pleasure of sailing and living upon. 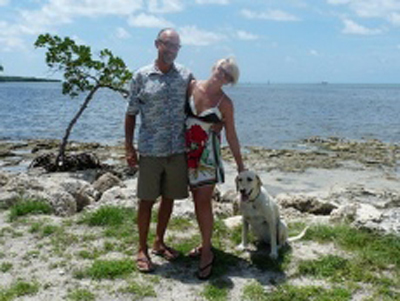 Eric has lived in Hawaii, Colorado, and California with prior careers in real estate development and property management. 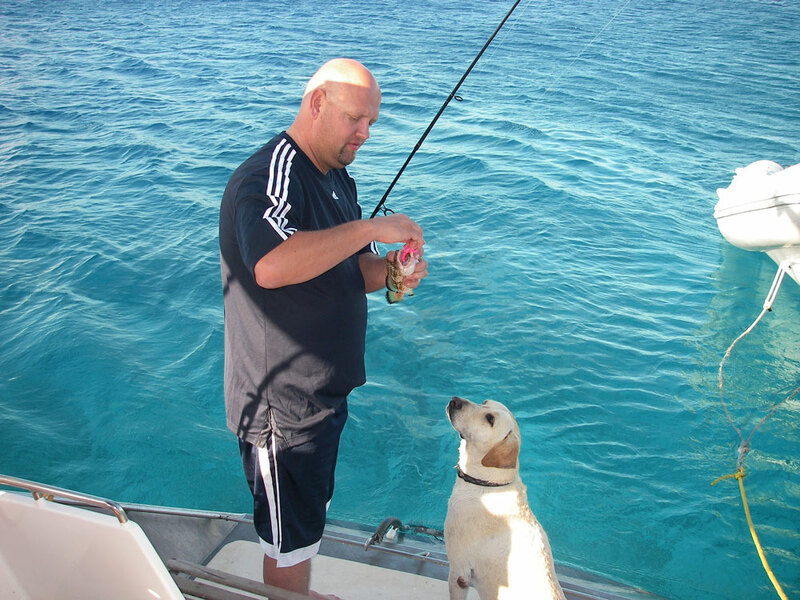 Besides having a US Coast Guard Captains license, Eric also holds licenses for PADI Divemaster (with endorsement to instruct Resort Divers), FAA Private Helicopter, Fixed Wing Pilot, Commercial Hot Air Balloon Pilot, and STCW Safety Certification. 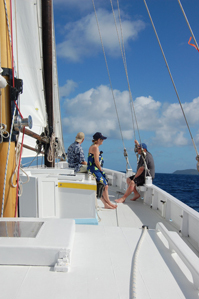 Eric's philosophy is your happiness aboard the Aloha Malolo is his happiness. Read this previous Blog Post for more info about Aloha Malolo and another one of Eric's philosphies: "Put Your Wallet Away" charters! 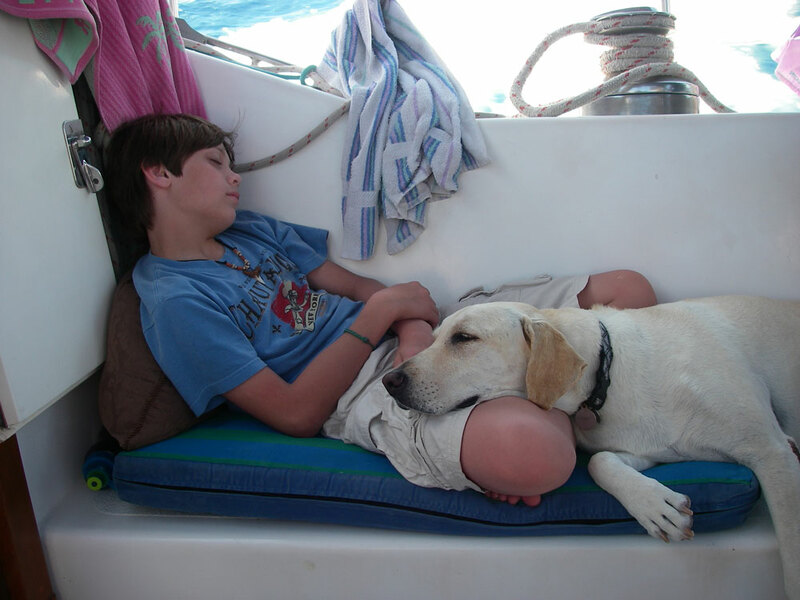 Salty Dog is truly Aloha Malolo’s original First Mate and is happy to join your charter or, if you're not the doggy type, don't worry, she also loves to stay ashore with one of the many fans vying for her attention. 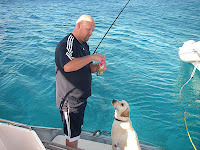 Salty is very well known in many ports; it is typical to hear someone call out “Hi Salty Dog” or “Aren’t you Salty Dog’s Dad? Where’s Salty?”. 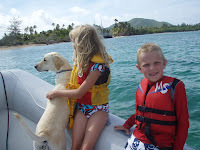 Salty is currently 9 years old and when not sleeping, can be found on the boats swim step enjoying her life’s passion….FISHING and looking for DOLPHINS to play with! "It is a balmy 57 degrees here in Colorado and the fireplace is roaring. We had our first dusting of snow last week and we are excited that the "Caribbean Countdown" has begun!" 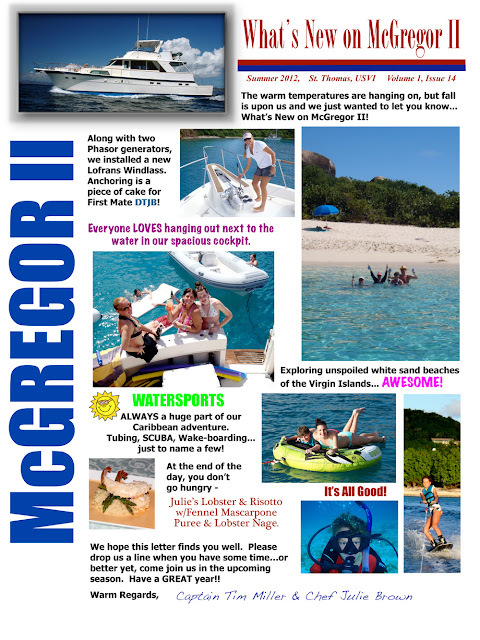 Paradise Connections is looking forward to visiting McGregor at the St Thomas charter yacht show in November. Built in the islands, Jambalaya is the real thing! 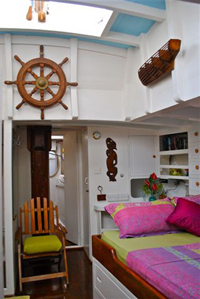 Enjoy space and comfort… Jambalaya is an elegant 73-foot, wooden Schooner with home comforts, spacious decks and great stability... Perfect for gentle cruising in the Grenadines! Guests can enjoy the magnificent en-suite Master Cabin, with a king-size bed and 9-foot headroom, with its own personal entrance giving total privacy! We always meet our guests at the airport, upon arrival and organize transportation. When on board Peter, the Captain will plan the coming cruise with the guests, ensuring they make the most of every glorious location. Whether our guests are experienced sailors or want to learn to sail, we give the opportunity to take the helm as little or as often as they want. 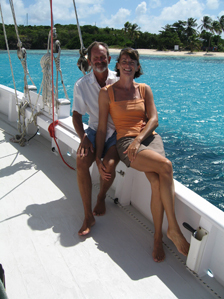 With many years of experience sailing in the Grenadines, we will sail to the “out of the way” anchorages and beaches. All our guests need to worry about is soaking up the sunshine and enjoying the sailing! All meals, drinks and cocktails are included, as well as a 2-person kayak, snorkelling equipment and even a complimentary Indian Head Massage! Romantic setting of a candle-lit beach in Tobago Cays for a Lobster BBQ dinner is part of our standard itinerary! 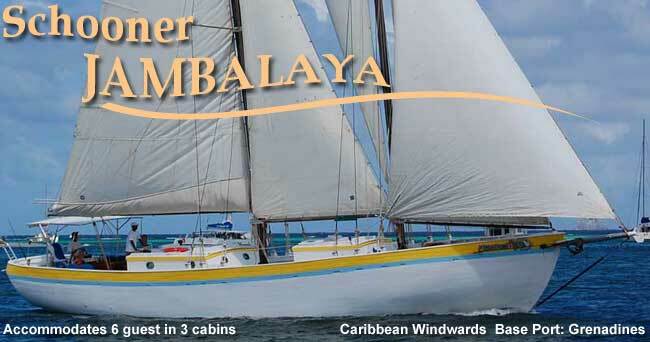 Imagine waking up each morning on your own private yacht, “Jambalaya”, in a different bay with a new Caribbean island to explore.